Hundreds of medical professionals are protesting government cuts to the interim federal health program, which provides extended health-care benefits to refugees. Doctors threw on their white coats Monday and rushed to Parliament Hill, which they say is the scene for the start of a national medical emergency: deteriorating refugee health. "We are launching into an uncontrolled, disastrous, human health experience by arbitrarily denying life-saving medical care to some of the most vulnerable and traumatized people in the whole world," said Dr. Mark Tyndall, the head of infectious diseases at the Ottawa hospital. "And for what? Further isolation and suffering, the spread of infectious diseases, increased wait times at our hospital emergency departments. Canada is way better than this." The benefits include prescription drugs and vision and dental care and will expire on June 30. After that, refugees will be divided into two categories and see their health care coverage pared back to emergency services only, or if their care is required to prevent or treat a disease that could be a public health concern. The Conservatives argue the extended benefits are better than those received by most Canadians. "We are rescoping the program to ensure that there is equity and fairness in health benefits," Immigration Minister Jason Kenney told a Senate committee studying new refugee legislation. But Tyndall said the government is playing politics. "The government has used this issue to divide Canadians, pitting those who are dissatisfied with their own health coverage against refugees," he said. "Canadians are smarter than this. This is an attack on our entire health-care system." The Conservatives also argue good health-care benefits attract bogus refugee claims. The government estimates that the cuts will save about $20 million a year for the next five years. But one Ottawa doctor says it's ridiculous to presume refugees come to Canada because of health care. Dr. Parisa Rezaiefar, who fled Iran more than 20 years ago, says refugees come to survive and often aren't given a choice as to where they'll end up. 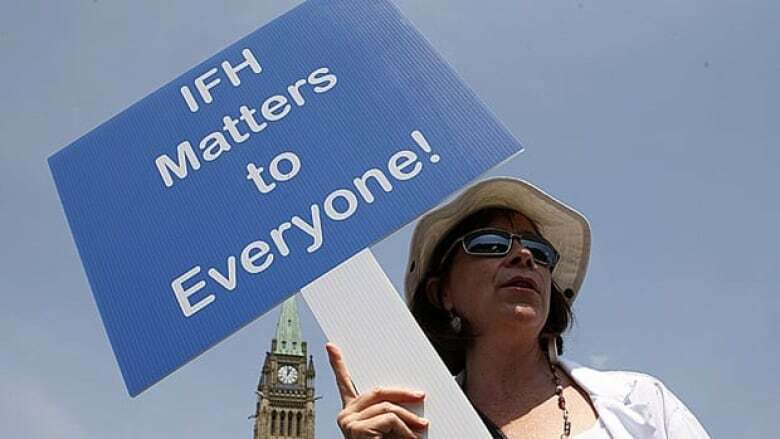 "The interim federal health program isn't a charity," an emotional Rezaiefar told close to 200 people gathered in the midday sun on Parliament Hill. Refugee advocates say the cuts are particularly egregious as they include care for refugees who are voluntarily resettled by Canada as part of its international obligations. According to a report released Monday, Canada, along with the United States, resettled four-fifths of UN refugees last year. What's the point if when they get here they are abandoned? asked Mado Mushimiyimana, who works at a downtown Ottawa clinic that serves a high number of refugees. "You should let them die where they are (rather) than come to be killed silently in this country," she said.